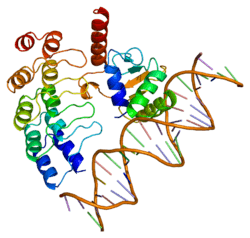 GA-binding protein alpha chain is a protein that in humans is encoded by the GABPA gene. This gene encodes one of three GA-binding protein transcription factor subunits which functions as a DNA-binding subunit. Since this subunit shares identity with a subunit encoding the nuclear respiratory factor 2 gene, it is likely involved in activation of cytochrome oxidase expression and nuclear control of mitochondrial function. This subunit also shares identity with a subunit constituting the transcription factor E4TF1, responsible for expression of the adenovirus E4 gene. Because of its chromosomal localization and ability to form heterodimers with other polypeptides, this gene may play a role in the Down Syndrome phenotype. GABPA has been shown to interact with Host cell factor C1, Sp1 transcription factor and Sp3 transcription factor. ↑ Watanabe H, Sawada J, Yano K, Yamaguchi K, Goto M, Handa H (Mar 1993). "cDNA cloning of transcription factor E4TF1 subunits with Ets and notch motifs". Molecular and Cellular Biology. 13 (3): 1385–91. PMC 359448 . PMID 8441384. ↑ "Entrez Gene: GABPA GA binding protein transcription factor, alpha subunit 60kDa". ↑ Vogel JL, Kristie TM (Feb 2000). "The novel coactivator C1 (HCF) coordinates multiprotein enhancer formation and mediates transcription activation by GABP". The EMBO Journal. 19 (4): 683–90. doi:10.1093/emboj/19.4.683. PMC 305606 . PMID 10675337. 1 2 Galvagni F, Capo S, Oliviero S (Mar 2001). "Sp1 and Sp3 physically interact and co-operate with GABP for the activation of the utrophin promoter". Journal of Molecular Biology. 306 (5): 985–96. doi:10.1006/jmbi.2000.4335. PMID 11237613. Chrast R, Chen H, Morris MA, Antonarakis SE (Jul 1995). "Mapping of the human transcription factor GABPA (E4TF1-60) gene to chromosome 21". Genomics. 28 (1): 119–22. doi:10.1006/geno.1995.1117. PMID 7590737. Sawada J, Goto M, Watanabe H, Handa H, Yoshida MC (Jan 1995). "Regional mapping of two subunits of transcription factor E4TF1 to human chromosome". Japanese Journal of Cancer Research. 86 (1): 10–2. doi:10.1111/j.1349-7006.1995.tb02981.x. PMID 7737900. Gugneja S, Virbasius JV, Scarpulla RC (Jan 1995). "Four structurally distinct, non-DNA-binding subunits of human nuclear respiratory factor 2 share a conserved transcriptional activation domain". Molecular and Cellular Biology. 15 (1): 102–11. PMC 231915 . PMID 7799916. Maruyama K, Sugano S (Jan 1994). "Oligo-capping: a simple method to replace the cap structure of eukaryotic mRNAs with oligoribonucleotides". Gene. 138 (1-2): 171–4. doi:10.1016/0378-1119(94)90802-8. PMID 8125298. Goto M, Shimizu T, Sawada J, Sawa C, Watanabe H, Ichikawa H, Ohira M, Ohki M, Handa H (Dec 1995). "Assignment of the E4TF1-60 gene to human chromosome 21q21.2-q21.3". Gene. 166 (2): 337–8. doi:10.1016/0378-1119(95)00575-7. PMID 8543189. Sawa C, Goto M, Suzuki F, Watanabe H, Sawada J, Handa H (Dec 1996). "Functional domains of transcription factor hGABP beta1/E4TF1-53 required for nuclear localization and transcription activation". Nucleic Acids Research. 24 (24): 4954–61. doi:10.1093/nar/24.24.4954. PMC 146336 . PMID 9016666. Suzuki Y, Yoshitomo-Nakagawa K, Maruyama K, Suyama A, Sugano S (Oct 1997). "Construction and characterization of a full length-enriched and a 5'-end-enriched cDNA library". Gene. 200 (1-2): 149–56. doi:10.1016/S0378-1119(97)00411-3. PMID 9373149. Batchelor AH, Piper DE, de la Brousse FC, McKnight SL, Wolberger C (Feb 1998). "The structure of GABPalpha/beta: an ETS domain- ankyrin repeat heterodimer bound to DNA". Science. 279 (5353): 1037–41. doi:10.1126/science.279.5353.1037. PMID 9461436. Suzuki F, Goto M, Sawa C, Ito S, Watanabe H, Sawada J, Handa H (Nov 1998). "Functional interactions of transcription factor human GA-binding protein subunits". The Journal of Biological Chemistry. 273 (45): 29302–8. doi:10.1074/jbc.273.45.29302. PMID 9792629. Itoh K, Wakabayashi N, Katoh Y, Ishii T, Igarashi K, Engel JD, Yamamoto M (Jan 1999). "Keap1 represses nuclear activation of antioxidant responsive elements by Nrf2 through binding to the amino-terminal Neh2 domain". Genes & Development. 13 (1): 76–86. doi:10.1101/gad.13.1.76. PMC 316370 . PMID 9887101. Bannert N, Avots A, Baier M, Serfling E, Kurth R (Feb 1999). "GA-binding protein factors, in concert with the coactivator CREB binding protein/p300, control the induction of the interleukin 16 promoter in T lymphocytes". Proceedings of the National Academy of Sciences of the United States of America. 96 (4): 1541–6. doi:10.1073/pnas.96.4.1541. PMC 15509 . PMID 9990060. Sawada J, Simizu N, Suzuki F, Sawa C, Goto M, Hasegawa M, Imai T, Watanabe H, Handa H (Dec 1999). "Synergistic transcriptional activation by hGABP and select members of the activation transcription factor/cAMP response element-binding protein family". The Journal of Biological Chemistry. 274 (50): 35475–82. doi:10.1074/jbc.274.50.35475. PMID 10585419. Guo A, Nie F, Wong-Riley M (Feb 2000). "Human nuclear respiratory factor 2 alpha subunit cDNA: isolation, subcloning, sequencing, and in situ hybridization of transcripts in normal and monocularly deprived macaque visual system". The Journal of Comparative Neurology. 417 (2): 221–32. doi:10.1002/(SICI)1096-9861(20000207)417:2<221::AID-CNE7>3.0.CO;2-4. PMID 10660899. Vogel JL, Kristie TM (Feb 2000). "The novel coactivator C1 (HCF) coordinates multiprotein enhancer formation and mediates transcription activation by GABP". The EMBO Journal. 19 (4): 683–90. doi:10.1093/emboj/19.4.683. PMC 305606 . PMID 10675337. Hattori M, Fujiyama A, Taylor TD, Watanabe H, Yada T, Park HS, Toyoda A, Ishii K, Totoki Y, Choi DK, Groner Y, Soeda E, Ohki M, Takagi T, Sakaki Y, Taudien S, Blechschmidt K, Polley A, Menzel U, Delabar J, Kumpf K, Lehmann R, Patterson D, Reichwald K, Rump A, Schillhabel M, Schudy A, Zimmermann W, Rosenthal A, Kudoh J, Schibuya K, Kawasaki K, Asakawa S, Shintani A, Sasaki T, Nagamine K, Mitsuyama S, Antonarakis SE, Minoshima S, Shimizu N, Nordsiek G, Hornischer K, Brant P, Scharfe M, Schon O, Desario A, Reichelt J, Kauer G, Blocker H, Ramser J, Beck A, Klages S, Hennig S, Riesselmann L, Dagand E, Haaf T, Wehrmeyer S, Borzym K, Gardiner K, Nizetic D, Francis F, Lehrach H, Reinhardt R, Yaspo ML (May 2000). "The DNA sequence of human chromosome 21". Nature. 405 (6784): 311–9. doi:10.1038/35012518. PMID 10830953. Galvagni F, Capo S, Oliviero S (Mar 2001). "Sp1 and Sp3 physically interact and co-operate with GABP for the activation of the utrophin promoter". Journal of Molecular Biology. 306 (5): 985–96. doi:10.1006/jmbi.2000.4335. PMID 11237613. Dhakshinamoorthy S, Porter AG (May 2004). "Nitric oxide-induced transcriptional up-regulation of protective genes by Nrf2 via the antioxidant response element counteracts apoptosis of neuroblastoma cells". The Journal of Biological Chemistry. 279 (19): 20096–107. doi:10.1074/jbc.M312492200. PMID 14985350. Shen G, Hebbar V, Nair S, Xu C, Li W, Lin W, Keum YS, Han J, Gallo MA, Kong AN (May 2004). "Regulation of Nrf2 transactivation domain activity. The differential effects of mitogen-activated protein kinase cascades and synergistic stimulatory effect of Raf and CREB-binding protein". The Journal of Biological Chemistry. 279 (22): 23052–60. doi:10.1074/jbc.M401368200. PMID 15020583.